Colors: Black, Burnt Orange, Caddis Green, Cream, Dark Brown, Gray, Light Brown, Fl Orange, Fl. White, Fl. Lime Green, Gold, Olive, Red, Rust, Tan. Antron Yarn was developed by DuPont for making rugs. Gary LaFontaine and John Betts popularized the material for fly tying. They found that the trilobal fibers produced a refractive attraction to the fly patterns they developed. The spooled Antron yarn by Hareline is a straight multi-filament yarn with a wavy texture. Antron Yarn is used to make wings on Spinners, overbodies, legs, and trailing shucks on Caddis emergers. It can also be used for wingposts on parachute patterns. 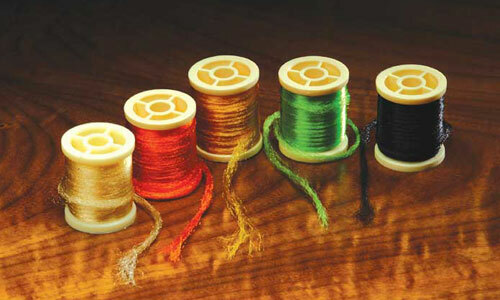 Each spool contains 4 yds. of yarn. See Color Chart.